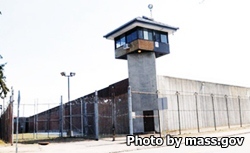 Massachusetts Correctional Institution Concord, MCI Concord for short, is located in Concord Massachusetts. It is a medium security prison that houses adult males and was once the reception and diagnostic center for all new adult males, but no longer is responsible for the intake process. This facility has many programs available to inmates including an alternatives to violence program that teaches conflict resolution skills. An emotional awareness and healing course helps teach skills to reduce disruptive behavior and a parenting program teaches the responsibilities of fatherhood. Inmates can also take several self help courses that include substance abuse programs and various twelve step programs. A calligraphy course teaches inmates focus and commitment through a proven technique. All inmates are allowed visits on Wednesdays, Thursdays, and Fridays from 1pm-8:30pm, and inmates have a rotating schedule on the weekend. On Sundays inmates with a last name A-C have visiting from 1pm-3:50pm and inmates L-Q have visits from 6:20pm-8:30pm. On Saturdays inmates with a last name R-Z have visits from 1pm-3:50pm and inmates D-K have visits 6:20pm-8:30pm. Non-contact visits are held on Fridays, Saturdays and Sundays from 6:30pm-7:30pm and 7:30pm-8:30pm. Non-contact visits also occur on Mondays at 1:30pm-2:30pm, 2:30pm-3:30pm, and 6:30pm-7:30pm.